Adding insult to injury the super practical 12-24V DC input you can plug a lipo into has changed to a 9V USB C plug. Believe it or not, this little iron is absolutely fantastic and is now my go to iron for all things quad related. The TS80 is now made from aluminium as opposed to plastic. Better yet the design is even smaller than the TS100. These changes make it feel really comfortable ergonomically and in turn makes it more usable. It honestly feels like using a pen rather than a soldering iron. Despite the smaller size the iron still features two buttons and a simple OLED display. The tips themselves are now shorter and interchangeable via a headphone jack. Changing a tip is something I rarely bother with but been able to do it in seconds is nice. The shorter tip gives you a bit more precision when soldering tiny components. The thermal efficiency. I'm not sure if this is the right term for it but despite been rated at around 25% of the power of the TS100 this iron performs nearly identically. Heat up times were around 20 seconds. Somehow with only 9V the iron can keep up with the TS100s up to 6s input which means you can power it off lower voltage devices without sacrificing performance. The packaging for the TS80 is rather small so I wasn't expecting to find much. To my surprise underneath the iron was a 9V power supply and a heat shielded USB cable that can be used to power the iron wherever you have an AC supply. I wasn't expecting this but it is a really nice touch if you want to use the iron at home without using your batteries up. 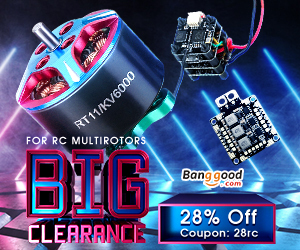 Get the TS80 on Banggood, it's currently on discount. To test the iron I used it to work on three of my quads. One was a repair and the other two were complete builds. The TS80 worked great on them all and the builds were a breeze. Large connectors or ground pads heated up quickly and I was able to make great quality solder joints with relative easy. The fact it heats joints quickly means you are less likely to damage or burn components whilst soldering. The bellow example shows an XT60 connector and ESC joints done with the iron. To power the iron I tried the included 2A powersupply and also the ISDT BG-8S battery checker. The battery checker has an XT60 input and the USB port supports Qualcom Quick charge 3.0. With a 4s lipo I was able to power the iron for over an hour before reaching storage voltage. I think the ISDT battery checker is an ideal way to use the TS80 if you have one. Alternatively I would recommend you look for a quick charge 3.0 capable power bank. The included tip was a small chisel type but I was able to make it work for all FPV applications from XT60 connectors to basic surface mount work. For general FPV use it is ideal but I may pick up a finer tip I catch them on sale at any point for PCB repairs. The below image shows a surface mount capacitor on a VTX I was able to fix with the stock tip. Awkward menu operation - To control the iron you use a series of short and long presses on one of the two buttons to both navigate the menus and change settings. After reading the manual this wasn't too hard but it was a little clunky. I often found myself waiting for menus or settings to time out so that I could go back where I wanted which can be frustrating. No custom firmware (yet) - The TS100 software was open source which allowed enthusiasts to rewrite the code and add their own improvements. These ranged from lipo voltage alarms and increasing the max temp to 450°C to even being able to play Tetris on the screen! Can’t be powered directly from a lipo - With the TS100 you could buy or make a barrel jack to XT60 connector to power it from a regular lipo. Due to the TS80s USB interface this is not possible and you need to find something to regulate lipo voltage to 9V. For this I recommend eithr the ISDT BG-8S or simply a cheap XT60 to USB QC3.0 convertors. Lack of Stand - This is not so much a problem but more a recommendation. Traditional irons come with some kind of stand or holster. These portable irons do not come with a stand which means you’ll have to be very careful where you put them down. Precariously balanced on top of your solder probably isn’t the safest way of working! The TS80 and TS100 are both fantastic irons and are both good enough to replace a desk based iron unless you have something really high end. If you are new to solderingy I would suggest you go straight for one of these two as your main iron. So which one? The upgrades on the TS80 make it a nice unit especially if you already own either a 9V power bank or the ISDT BG-8S battery checker. However the TS100 is more convenient for use with a lipo and is a little cheaper. In it's favor the TS80 does come with a 9V powersupply and is usable out of the box where as the TS100 requires a high voltage DC input or an XT60 adaptor cable. All in all, if these irons were the same price I would take the TS80. The problem is with the TS100 going so cheap these days it's hard not to recommend it. You really can’t get better performance and convenience for that price in any iron period! Whichever way you go you're going to end up with a great yet cheap iron. The decision ultimately comes down to your personal preferences on quality, convenience and budget. Either way it's a win/win situation.